This little blog post isn’t about exercising. It’s not about conquering your New Year’s Resolutionor creating a healthy living routine. This little blog post is about what happens when you do the next right thing. I’ve mentioned before that I’ve suffered from depression. I still vividly remember what it feels like to need my bed. People in the know prescribed exercise. I agreed with them, walked out of the clinic, and promptly returned to my bed. It’s been a while, but I still remember how exercise was the last thing I wanted to do when I was depressed. So right now, I’m speaking to you. The one with the winter blues, the one with the long-term depression, the one with the defeated thoughts. Ready for my stellar, life changing message? Today, put on your coat. Tomorrow, put on your coat and walk to the end of the driveway. The next day, put on your coat, walk to the end of the driveway and then continue around the block. 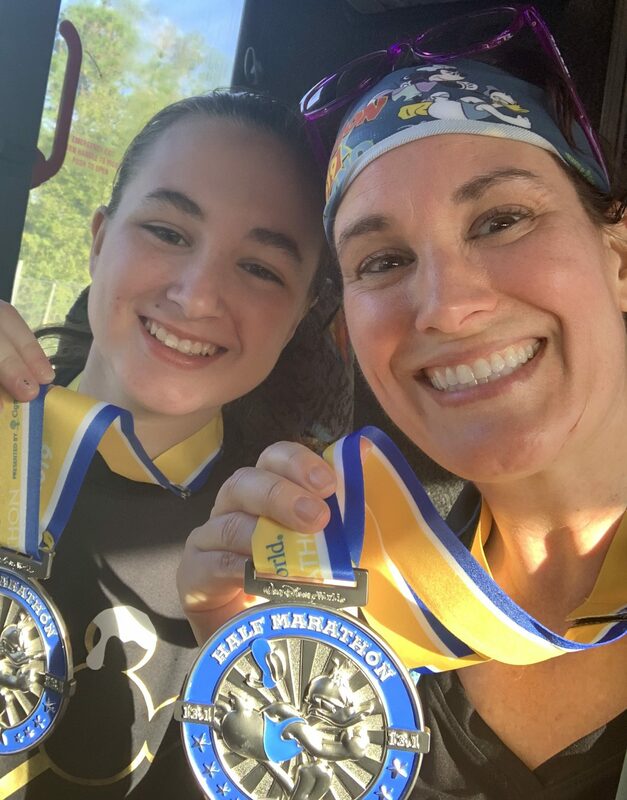 When my 11 year old daughter asked me to do the Disney Half-Marathon with her (3 years ago), I said, “Sure, Honey.” I knew that I would never run 13.1 miles. I couldn’t even run 30 seconds. Jordan couldn’t enter the race until she was 14, so I figured there was no point in arguing about something she would surely forget within the next 3 years. Guess what? She didn’t forget. We registered last July and she badgered me all summer long about beginning a training program. Finally, 4 months before Race Day I put on my shoes. Then I walked/ran for 10 minutes. Then I took a long shower and rewarded myself with ice cream. The next day I did it again. My Nike running app says I’ve run 102 times for a total of 280 miles. Yesterday I proudly put new stickers on my car. They say 0.0, 5K, 10K, 13.1. My family asked why I bothered putting the 0.0 sticker on. I said it’s because I want to remind myself and others that I started at nothing. Little by little we can do big, hard things when we do the next right thing. When I was running 1 mile, I never thought about running 13.1 miles. I just tried to get through that single mile. You’ve got mountains to climb, Friend. The view from the top will be spectacular. But don’t worry about the top of the mountain right now. Right now, just put on your coat.